Wisdom of Life. : This is my 1000 title posting. Do you know this is my "One Thousand" title posting? I just could not believe it!!! When i first started on the 22nd March 2007, the first title posted was 'Beautiful World', it was merely fun and curious about blogging. Actually i was instigated by my elder son, Alvin who linked me to his blog site prior to me creating my Wisdom of Life. He thought only younger people could blog and write, but i wanted to prove him wrong that the growing up senior could blog as well. Nothing is impossible when love and passion is there. The first few months were quite easy for me to write because i had plenty of ideas and stories in mind. As time went along, i almost wanted to give up as i began to feel the toughness of getting more articles to share. Though i might not have many readers at that time, i was lucky to have some comments from the anonymous who gave me encouragement to continue. I picked up courage and commitment, when i realised my cheekiness and creativeness were my strength and asset. The more braver i gained, the more confidence i wrote. I gathered what i saw in my daily life and turned them into stories and wisdom. I wrote the frankness of the world, the ugly and the wonderful part of life. The more i wrote about the hidden part of life, the more my readers love to read and learn. I know my sharing had benefited many, i had amused my readers to laugh, i had taught them to be brave and naughty too, i had encouraged them to be more loving and caring and i had also made many friends along the way. Even my little darling sometime gets jealous because she knows there are some secret admirers who are in love with me through blogging. I feel great and honour because my blog had also saved some souls. The title, "What is Love Sick?" had actually saved a woman from committing suicide while she was suffering from one. My selling ideas, perhaps had helped those who were at lost in selling. I had overseas readers who came to my homeland to shake my hand. The person that most benefited from this blog is no other than myself. I had expanded my mind while gathering facts and ideas, and i had maximised my creativeness to the peak. I was never a writer before, except making my mouth to earn my living. Today i am so glad that i could express my thought verbally and in words. Talking and writing isn't the same. Talking could be easier but writing is tough. To master the both habits need plenty of training and effort. I wrote what i feel from my head and heart. In case if i do offended someone out there, please don't take it too hard. May i ask for your forgiveness? I give my thousand of apologies to you. Yes! This is my 1000 mark. To The Almighty Universe i pray, please allow me to write another 1000 more. I promise to give my best and sincerity to Wisdom of Life here. Congratulations on your 1,000 title posting!!!. You have persevere through and we received so much from your blog in terms of encouragement, wisdom, support, widen and increase our knowledge, alter our perspective in our thoughts, change our attitude. All in all to be a better person in life. 1000 titles...1 title a day for almost everyday is not easy. It takes a lot of commitment, perseverance and wisdom(of course) to keep your blog updated. You have my SALUTE as I do understand that it is quite a tough job. By the way, do you know that I have made your blog as my "breakfast" before I start my work? 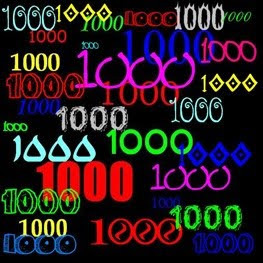 1000 sharings and we learn 1000 things.Thank you and may another 1000 titles to go. Thank you for all your sweet and encouraging compliments. You spur me to write further. I would try to make happier people, providing breakfast laugh before they start the day and to share more of what i see and learn daily. Your support and comments are most appreciated. Thank you once again great friends. hi dad, well done and many congrats to your 1000 blogs. I m glad that you taken up blogging and perfected it. We are all blessed with your sharing of your experiences and knowledge. Pls continue to blog and i hope to see you at blog no. 10000. Thank you for introducing dad into blogging. I do not know how to untie my addiction now. U are part to blame son. We would clock blog number 10000 together. Ok? As a final note , let me thank you for your patience with my English as (I'm sure you have figured this at this time ,), English is not my original tongue hence I am utilizing Google Translate to shape out what to record what I really want to say. Свежая возникновение дабы хрумера с параметрами - это проверенная чтобы ТИЦ и чтобы наличие в яндекс каталоге ресурсов, предназначенная для регистрации и постинга с помощью хрумера последней версии. Начиная с этой базы, неотлучно базы чтобы хрумера будут прятаться приблизительно ХАЙД ( благодаря 5 предварительно 100 комментариев /сообщений ). Отдельная вытье к форумчанину с ником smocki ради форуме ботмастера вокруг выкладывании баз для форуме давать активную ссылку ради распространенный ресурс.